If you have previously linked your website(s) to your Google+ profile using authorship tags (or through rel=author), you can now see some important stats about your incoming Google search traffic right inside Google Plus itself. 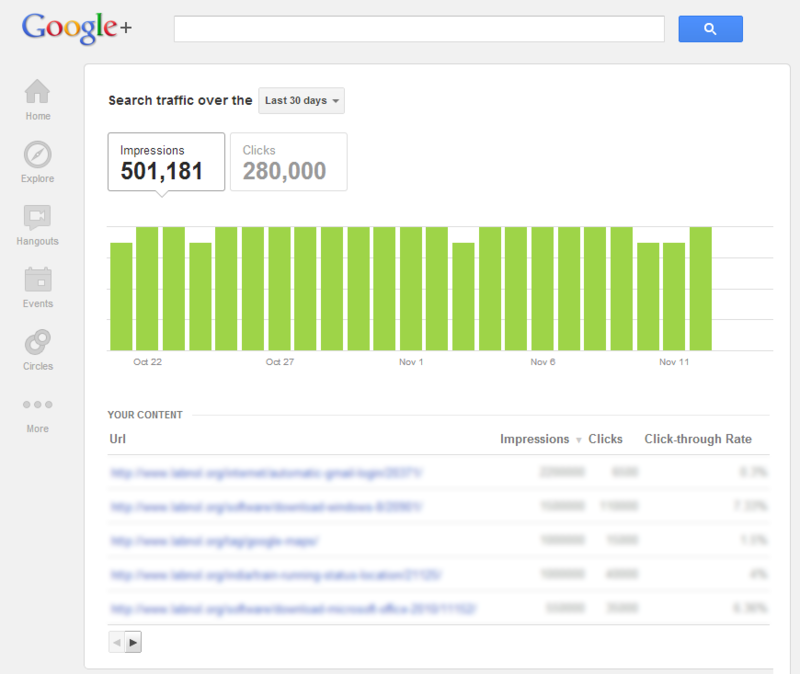 Go to plus.google.com/authorship/analytics and it will show you Impressions (number of times your articles appeared in Google search results) as well as Clicks (number of times your articles were clicked in Google results) for the last 30 days. The report also carries similar stats for individual pages on your website(s). Getting on the front page on Google is important (impression) but unless search users aren’t clicking on your page in search results (click), that rank is mostly wasted. That’s where good titles and meta descriptions can make a difference. The reports in Google+ do not display your site’s exact ranking in Google Search but if the “impression” count is 100K or greater, your site is performing quite well and you probably need to work on factors that will further improve the click-through rate (or clicks). Update: It looks like these reports in Google+ aren’t available to all publishers yet and hence the above link could be returning a 404.